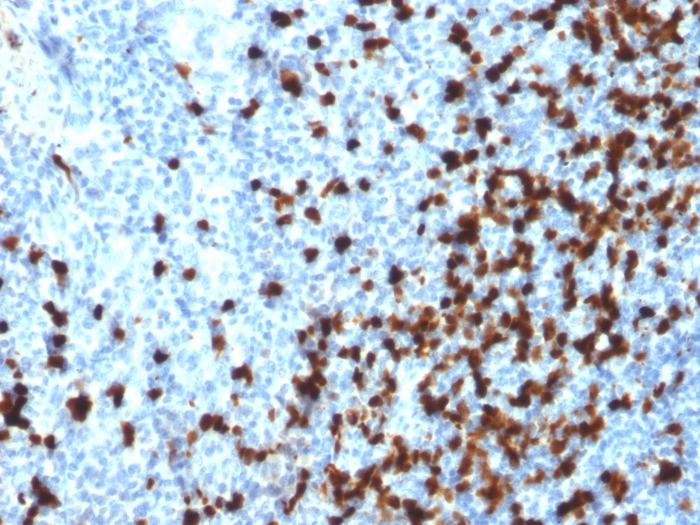 Formalin-fixed, paraffin-embedded human Tonsil stained with TCL1 Mouse Monoclonal Antibody (TCL1/2079). 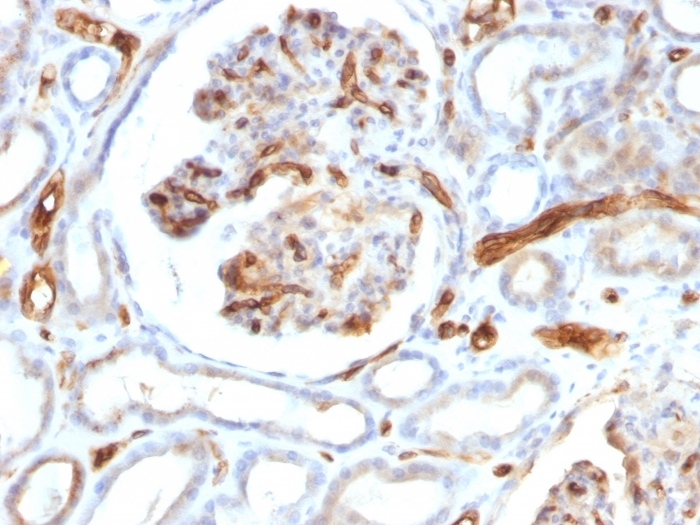 Formalin-fixed, paraffin-embedded human Lymph Node stained with TCL1 Mouse Monoclonal Antibody (TCL1/2079). 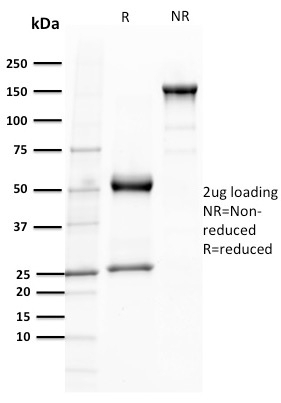 Western Blot Analysis of Raji cell lysate using TCL1 Mouse Monoclonal Antibody (TCL1/2079). 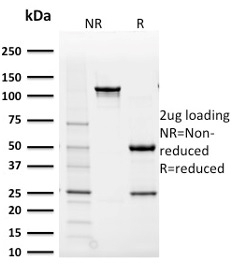 SDS-PAGE Analysis Purified TCL1 Mouse Monoclonal Antibody (TCL1/2079). Confirmation of Purity and Integrity of Antibody. Analysis of Protein Array containing more than 19,000 full-length human proteins using TCL1 Mouse Monoclonal Antibody (TCL1/2079). Ramos or Raji cells. 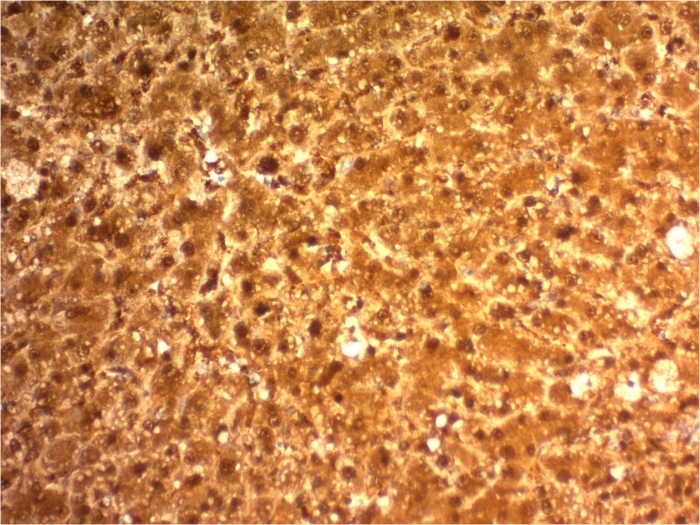 Tonsil or T-cell Lymphoma. 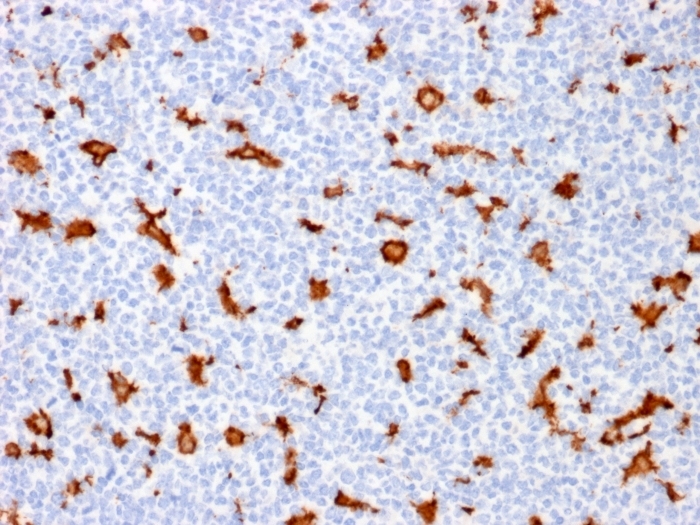 T-cell leukemia/Lymphoma Protein 1A (TCL-1A), also known as p14TCL1 is a product of the TCL1 gene that is involved in T-cell prolymphocytic leukemia (TPLL). T-PLL is a rare form of mature T-cell leukemia, which is consistently associated with chromosomal rearrangements characterized by the juxtaposition of the TCRA locus on chromosome 14q11 and the TCL1A gene on 14q32.13. 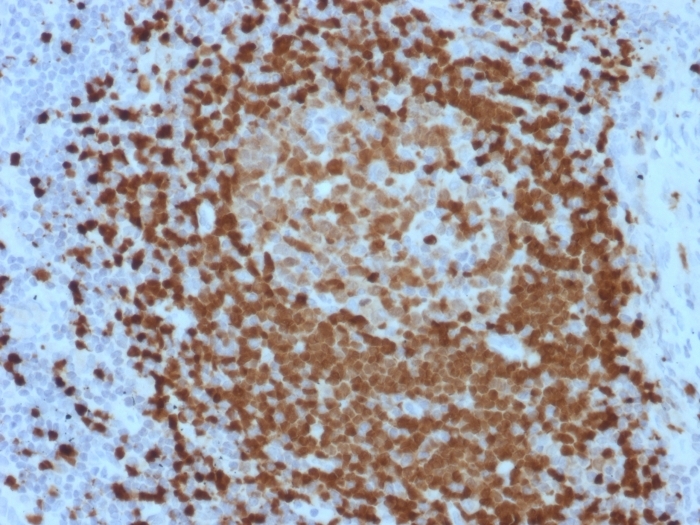 TCL1 is overexpressed in Burkitt lymphoma, the majority of AIDS-related non-Hodgkin lymphoma-designated immunoblastic plasmacytoid lymphoma, lymphoblastic lymphoma, chronic lymphocytic leukemia, mantle cell lymphoma, follicular lymphoma, diffuse large B-cell lymphoma, and primary cutaneous B-cell lymphoma. Roos J, et al. Pathobiology. 2001; 69:59-66. Narducci MG, et al. Cancer Res. 2000; 60:2095-100.